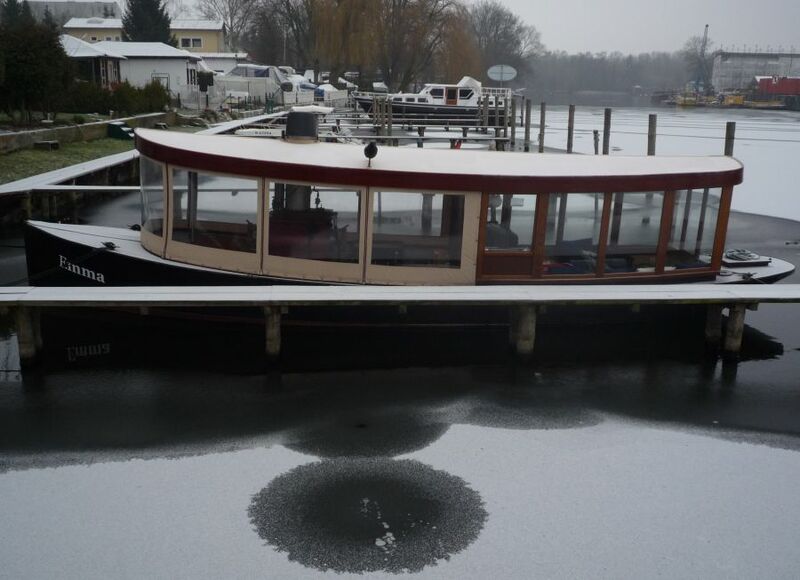 At the harbor of Emma in Berlin Spandau, everybody told me that it is more or less ice free. I really liked to believe this because on one hand to save money for the cran and the storage house and on hand because I liked to make some winter trips - what I in deed enjoyed very much. 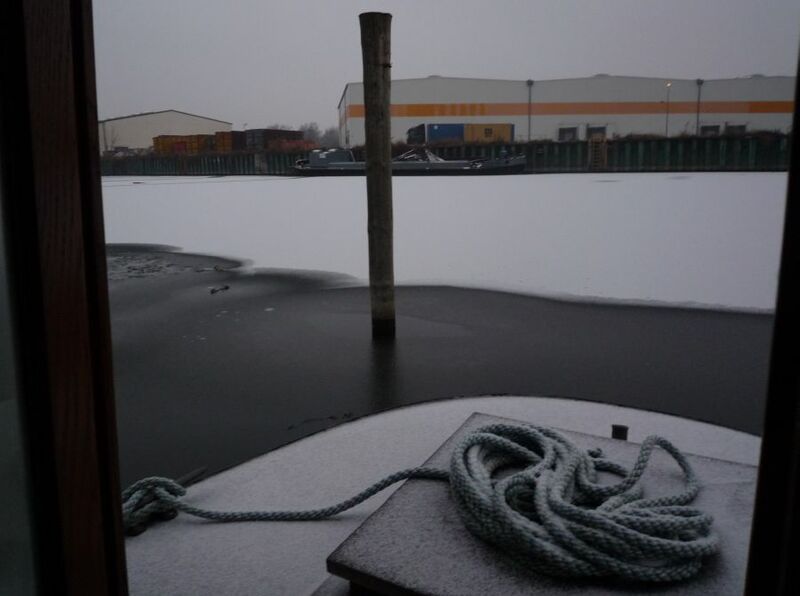 The first snow arrived at the 23. of November 2011. I only had to fill up the boiler to make a sunny winter trip without any disturbing noisy gas boats around me. Near the boiler and the engine it was cozy warm. When I took of the "curtain" I had to wear a cap and a shawl. But in the cabin it was lousy cold. 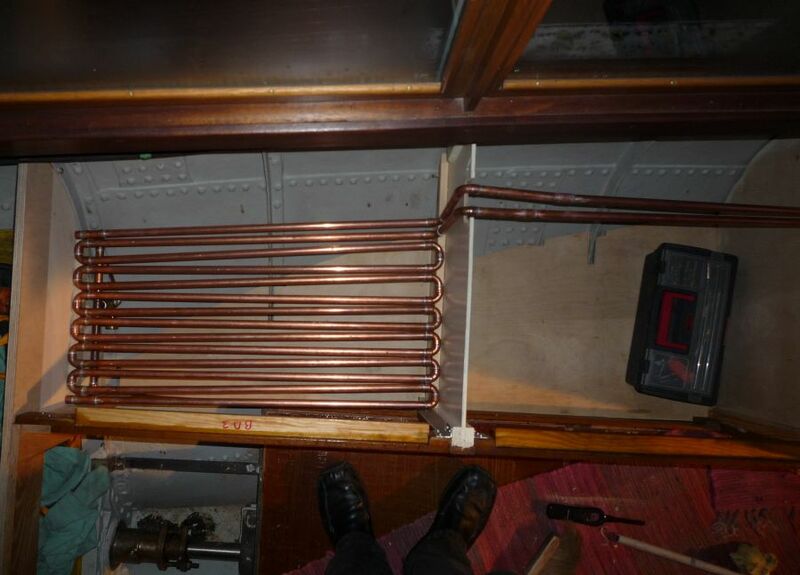 So I planed to build in a steam radiator for heating. Unfortunately I could not find one. So I had to weld together some coper pipes as a compromise. Because of the little radiating surface you only felt warm close by this unit - but it helped more then nothing. It is coupled to live steam and the condensate goes direct into the hot well. In summer this radiator is a handy shelf under the bench. Outfitted with this equipment I planed a New Years trip at the 01.01.2009 with my friend Werner from Switzerland and the "girls". But right on time the harbor was frozen. Luckily Emma was moored in a low water flow - strong enough to bring up some warm water from the depth to the surface. 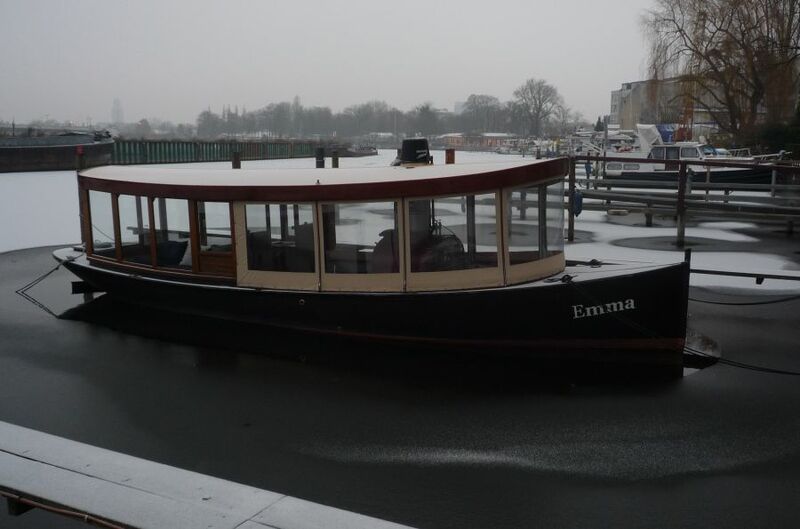 After two weeks with temperatures deep under the freezing point also Emma was locked by the ice. 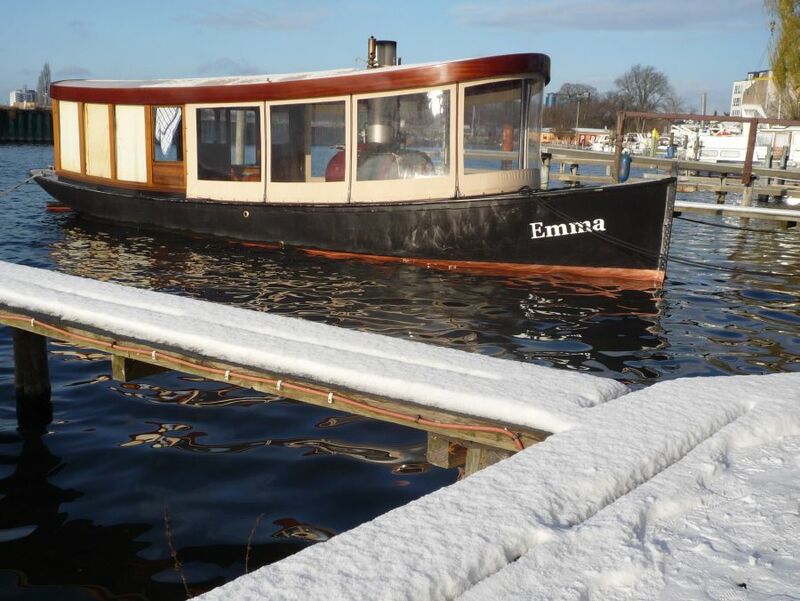 But the bilge of Emma was still warm enough to keep it from being iced. During that time I worked about 190 km away from Berlin and could take care of her only at weekends. So I was happy to have a friend who looked after her some days. 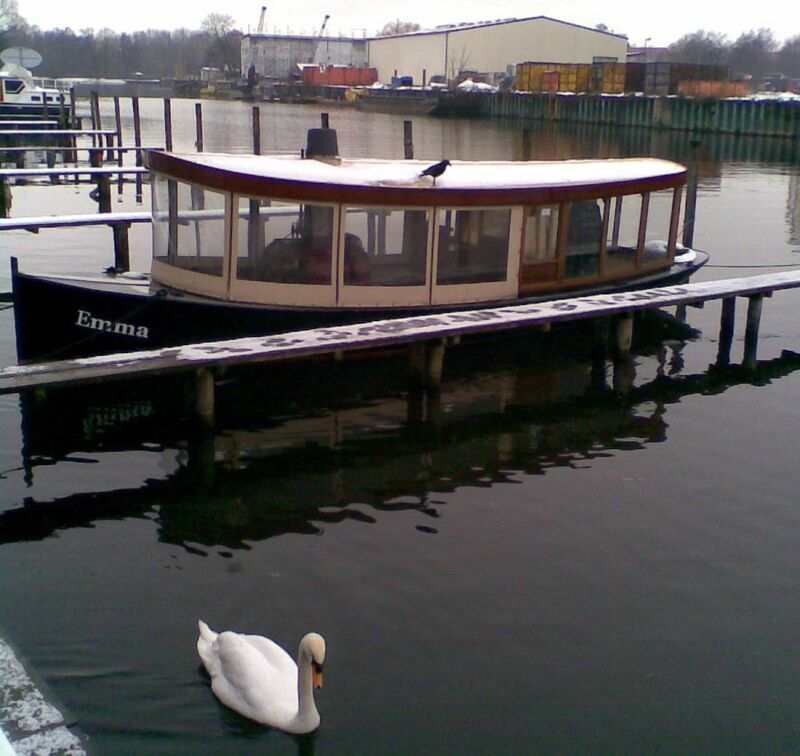 At the end of February all ice around Emma was gone and she swam with the swans. © of all items by Rainer Radow, Germany. Please send your comment or a short hello.